Sharing files via Skype is now a lot easier, thanks to its new OneDrive file-sharing add-on. The feature, which is currently in the testing mode, is available only for Skype Insiders. Anyone who wishes to test the new feature can head to Skype Insider Program and install the Skype Preview (Version 8.35.76.30). 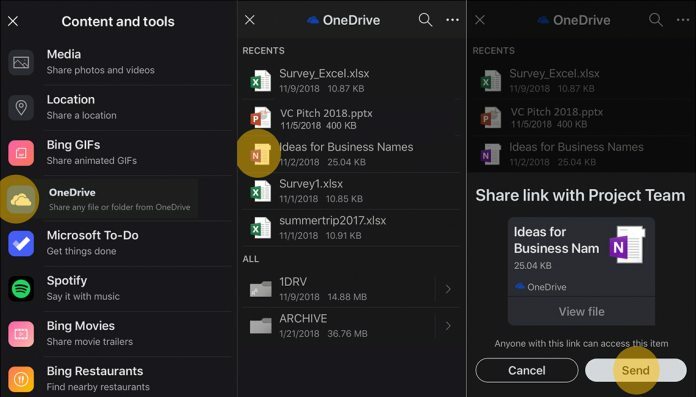 The Skype and OneDrive integration lets users share their OneDrive files with their friends, family members, or coworkers directly in the chat window. How to Share OneDrive Files with Skype Contacts? Sharing OneDrive files in Skype is easy as pie. All one needs to do is click on the “+” icon (Content and Tools) at the bottom of the chat window and click on OneDrive. Skype then displays all the files and folders stored in OneDrive. To share a file or a folder, one needs to select it and click “Send.” Skype then sends a direct link to the file or folder to the recipient. If a Skype contact is not on a version that supports OneDrive file sharing, they will still be able to access the shared content via a browser on the OneDrive website. If the contact has the OneDrive sharing feature enabled, they can preview the content natively, inside the Skype application. As said earlier, the feature is currently available only for Skype Insiders and is expected to be rolled out for all users soon.